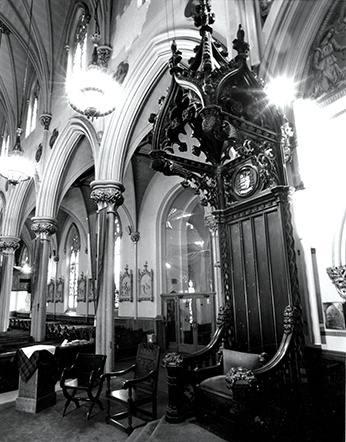 From Newark's earliest days to the present, furniture has been a constant part of its history. From the great chair that Robert Treat used at council meetings to the sonorous voice of 'Bertha,' Bushberg's TV super saleslady of home furnishings, the appointment of home and hearth has been significant here. In the 1870s, in his 'Industrial Interests of Newark,' William Ford wrote, 'There is not but a single branch of industry more closely associated with the general advance of culture, refinement and domestic economy than the manufacture of furniture. 'Scarcely anything more accurately indicates a nation's progress in civilization than the peculiarities and styles of furniture in vogue at any given time. And the general utility, convenience and elegance of the furniture now in use constitute valuable results of the general progress in the useful arts.' At that time, Newark's market extended throughout New Jersey and New York and as far as Washington, D.C., Richmond, Va., and cities farther south. Newark residents had the satisfaction of knowing that no better grades of fine furniture were made anywhere than in their own beautiful city. While it was not in the cartouche of Charles Brasham's famous 1806 map of Newark, along with leather products, brewing or quarrying, the manufacture of furniture was equally important, as documented in the township's records. By 1836, the year of the rise of a modern city from the old township, David Alling, a major producer of fine chairs, completed his apprenticeship and also voted in favor of establishing the new city government. Atkinson, in his 'History of Newark, ' noted that 'chairmaking was quite extensively carried on here,' singling out Alling as highly esteemed and one of the most active and energetic businessmen of the town. Alling established a reputation for style and workmanship. He not only supplied a large home trade but also an extensive Southern demand, especially from 1825 to 1836. While a long list of furniture makers could be compiled by checking the Newark city directories from 1836 on, this is not our present purpose. We want to show instead the variety of products made here, to enumerate a few contemporaries, and to point out two of the best-known men who made an exceptionally fine product: David Alling and John Jelliff. Alling was one of America's leading makers of 'fancy chairs.' Jelliff was a craftsman who kept up the leading 19th century designs, but insisted on hand work in an era of machine-produced furniture. Early manufacturers other than Alling and Jelliff also left their marks in Newark and carried its name beyond the community. Turner and Broad, of 85 Frederick St., employed 25 hands and produced a general line of furniture including bedsteads, tables, extension-tables, bureaus, cribs and cradles. William Hemmer of Bloomfield Avenue and the Morris Canal specialized in office furniture. It was the only firm in Newark that made this a specialty and is remembered for the manufacture of library tables, book cases and cylinder desks. Broad Street's Nathan Muzzy and Charles Merchant were wholesalers and retailers of chairs, sofas and picture frames. William B. Douglass of 65 Market St. made sofas and Venetian blinds and furnished, at short notice and on reasonable terms, coffins, shrouds and hearses. In the early 1830s, Daniel and Lemuel M. Crane were cabinetware manufacturers near the eighth lock of the Morris Canal. Their showrooms were at 319 Broad St. Dermit and Looker at 843-45 Broad St. was doing business by 1836, and its sales extended from Richmond to New Orleans. The company survived the Civil War and was later active in New York, where it specialized in bedroom furniture of walnut, mahogany and rosewood. John Ruckelshaus of 845 Broad St., founded in 1864, specialized in upholstery, parlor suites, tete-a-tetes, sofas and lounges. Smith and Hodges of Passaic Avenue was established in 1865 and also manufactured business furniture. David Walker of 8 Commercial St. made self-rocking, hand-swing and common cradles. They also produced folding and set-up crib bedsteads. Obviously, these companies produced far more items than could ever be sold locally or even in the greater New York area. Without an excellent transportation system in place, including steam, sail and rail, these companies never would have survived or prospered. We see again early, in its industrial history, that Newark owed a great debt to the railroad and to shipping. John Jelliff was Newark's most important furniture, chair, and cabinetmaker of the second half of the 19th century, as David Alling was in the first half. Nobody came close to replicating Jelliff's talents and accomplishments. For 50 of his 80 years, Jelliff ruled supreme as a leading Newark businessman and artist. During that time he built a large and prosperous business and became a prominent citizen, earning a silver medal for his achievements from the Essex County Institute for 'integrity and outstanding business dealings.' Jelliff's friends reported he was strait-laced, honest, hardworking and dedicated to making the finest furniture possible with his own hands in a world dedicated to machine- crafted products. To maintain his own standards of quality control, Jelliff bought the wood he used at auction, aged it for two or more years and often would hand-carve delicate features himself rather than allow them to be mass-produced. The large Jelliff family included three boys, who unfortunately did not live to maturity, and five daughters. They managed their own financial affairs after marriage, upon their father's advice, to ensure their financial security in later life. Newark's master chair maker was born in Norwalk, Conn., in 1813 of parents whose family came from England in 1745. In August 1828, he was apprenticed to Lemuel Crane of Newark to learn 'the art, trade and occupation of cabinet-making.' At that time he was one of several apprentices who had come in from the countryside to work in bustling Newark. The human side of young John appeared with his protest against the monotonous and unappetizing daily breakfasts of boiled mackerel and potatoes. In doing so, he pinned the following message to the workroom door: 'Oh Lord of love, look from above On us poor cabinet-makers. And send us meat that is fit to eat, And remove the fish and potatoes.' Apparently the note worked and Jelliff and his cronies survived, for Crane's fish and potato breakfast was soon supplemented by more appetizing fare. In 1835, Jelliff, upon completing his apprenticeship as cabinet-maker, entered business as a 'freeman,' married Mary Marsh and moved to 13 Fair St., where he began a family. He later moved to 301 Broad St. and finally bought a large property at what became 70 Johnson Ave. There he built a comfortable house and lived for the rest of his life. He attended Grace Episcopal Church and served as vestryman there. In 1838, he entered into a partnership with Thomas L. Vantilburg and opened a shop at 333 Broad St. The City Directory that year indicated that his company manufactured and sold cabinets, furniture, 'Mahogany Chairs, Sofas, Mattresses. (And that there) will be found at all times at their Ware Rooms, a splendid assortment of Cabinet Ware of the latest patterns, cheap for each.' In 1855, upon the death of David Alling, Jelliff took over that business. He was joined in partnership by Peter G. McDermitt for the next four years. An 1855 advertisement indicated he was engaged in the 'Wholesale and Retail of Fancy and Common Chairs, Keeping constantly on hand at his Ware Rooms, Rocking, Fancy, Cane Bottom and Common Sitting Chairs, made in a substantial manner and of the latest patterns.' In 1866, the City Directory carried a full-page advertisement for his 'Parlor Furniture: Hair Husk and Mattresses; Rosewood, Mahogany and Walnut Chamber Furniture of Every Description and Price . . . all for ready cash.' Moreover, the reader was admonished that 'Our Furniture is still the best made in the best manner as heretofore and all of it is warranted as represented. Our rooms are spacious, storage large and well assorted.' In 1872, curtains, lambrequins and shades were added to the stock, and in 1874, mantels, pier glasses and cornice were included, as well as woven wire mattresses and a National Wire Spring Bed. As New Jersey's leading commercial center, Newark has also been a mecca for furniture stores and large department stores with furniture galleries. Remember the third floor at Hahnes, which was similar to New York's Bloomingdale's? Or the furniture departments at Bamberger's and Kresge's? Before the Civil War, Amos Van Horn, born in Warren County, moved to Newark with his parents. With the arrival of the Civil War, he enlisted in Company A of the 26th Regiment, selling his furniture repair business for $25. Van Horn returned to Newark after the war and built a large furniture sales business. During his lifetime, he owned several furniture warehouses, offices and sales rooms in the center of the city. Unfortunately, he did not live to see the completion of his six-story Market Street building with its lighted tower, but his influence on Newarkers even today is considerable. In the latter part of his life, Van Horn gave away considerable amounts of cash anonymously and provided for the decoration of our parks with their most important statuary. Among them, Van Horn underwrote the Seated Lincoln in front of the Essex Country Courthouse, the Washington Statue in Washington Park and the large Wars of America Memorial in the center of Military Park. Edwin A. Kirch and Co. opened after the blizzard of 1888, first on Broad and later along Washington Street. In 1954, it moved to the suburbs. The store's motto was 'Don't just sell furniture, do it in a friendly way.' Peter Schuckhaus did business in several different places along Ferry Street. One three-story building reportedly had 'everything in the line of house-furnishing goods . . . from those of the most expensive and artistic makes and finishes to the plainest and cheapest.' Schuckhaus handled the productions of many leading American manufacturers and was known to 'warrant his goods exactly as they are represented.' Even today, Newark continues to have an interest in furniture. Four companies in the New Jersey Manufacturing Directory are included: Leonard Co., which makes bedframes and headboards and is located along McCarter Highway, the R.J. Hoppe Co., involved in furniture lamination; the Continental Mattress Co. with its mattresses, beds and box springs, and the Shifman Mattress Co. The telephone book lists 34 dealers who sell household furnishings. While we no longer produce fancy chairs or elaborate parlor and chamber sets, Newark furniture is still a useful product and remains important to the city's contemporary commercial life.